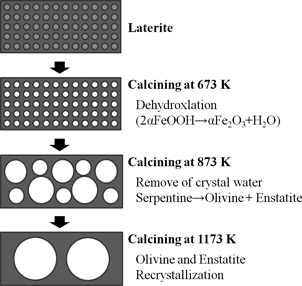 The optimal carbothermic reduction parameters of limonite ore and the influence of calcining temperature on these were investigated. In addition, the impact of the addition of Na2SO4 on limonite ore which had been calcined before reduction at optimal carbothermic conditions was also investigated. XRD analysis, BET-specific surface area analysis, bromine methyl alcohol solution analysis, and chemical compositional analysis were used in order to obtain the associated parameters. The best nickel grade and recovery rate of the 673 K-calcined limonite ore can reach >30 mass% and 90.2 mass%, respectively, when the reduction temperature is 1373 K, with a reduction time of 30 min, and a carbon-oxygen ratio of 0.6. This is because the 673 K-calcined limonite ores have the highest specific surface area of 46.8 m2/g with pores in the size of 29.7 Å. The addition of Na2SO4 by 5 mass% resulted in the best nickel grade of >30 mass% and the best recovery rate of 93.8 mass% at the same reduction temperature, time and carbon-oxygen ratio.